Warfarin, a blood thinner that’s been around for decades, can trigger a range of side effects. Common ones include nausea, vomiting, diarrhea and abdominal pain. The most common side effect — bleeding — can be life-threatening. Rare side effects include stroke, gangrene and death. 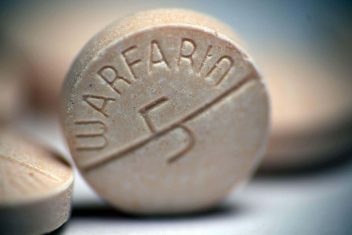 While warfarin (Coumadin) can be a lifesaver for patients suffering from atrial fibrillation and other conditions that place them at risk of suffering a fatal blood clot, the drug also has its drawbacks. Bleeding is the most common side effect. The risk, detailed in a black-box warning on the drug’s label, can be avoided through frequent blood tests and dose adjustments. Vitamin K injections are used in bleeding emergencies to reverse the drug’s anti-clotting action. The drug has more than a dozen other common side effects ranging from inflammation of the skin (dermatitis) to nausea. Vomiting, diarrhea, bloating and abdominal pain are common. can result in hives as well as anaphylaxis. When anaphylaxis occurs, the condition can become deadly and requires immediate emergency medical attention. cholestatic hepatitis has been found to occur in patients taking both Coumadin and ticlopidine (a drug that also helps to prevent blood clots), simultaneously. leads to inflammation and damage to blood vessels, primarily in the skin. Less common complications include bleeding in the brain, known as a hemorrhagic stroke. Warfarin patients are required to undergo regular blood tests to monitor the drug’s effectiveness. But not doing so can result in incorrect dosages and an increased risk for excessive, potentially life-threatening bleeding of the gastrointestinal tract and other regions of the body. Warfarin, specifically in its brand-name form Coumadin, is also associated with these rare but serious side effects: Tissue death, or gangrene, and calciphylaxis, which involves the calcification of a patient’s blood vessels. The painful condition often leads to sepsis and organ failure and is fatal 60 to 80 percent of the time. Other serious side effects can include acute injury to the kidneys and cholesterol embolisms (or clots) that travel through the bloodstream and become lodged in various blood vessels. The oldest anticoagulant is warfarin, also known as Coumadin or Jantoven. Normally, when a person bleeds, clots form to stop the flow. However, bleeding can last much longer than usual in individuals taking blood thinners, and may require emergency medical attention. Wounds and bruises may also take longer than usual to heal. 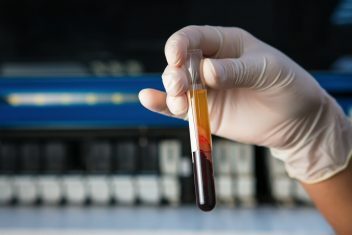 Major and sometimes deadly bleeding is more likely to occur within the first month of a patient using Coumadin, according to the drug’s label. 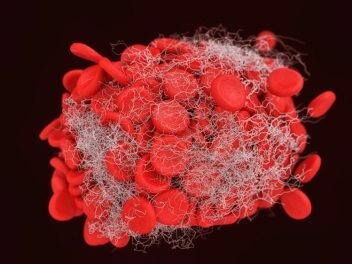 Patients are at a greater risk of experiencing this side effect if they have an elevated International Normalized Ratio (INR), a measure of how long it takes a person’s blood to clot. While an INR of 1.1 or less is normal in a healthy person, individuals using warfarin usually need to keep their INR in a therapeutic range of 2.0 to 3.0. But every single-point increase in a person’s INR doubles their bleeding risk. An INR over 4.0 can be a sign of “high-intensity anticoagulation,” putting a patient at an increased risk for major bleeding. Internal bleeding can include gastrointestinal bleeding as well as bleeding in the brain. Both conditions can be fatal. A a 2005 study in the journal of General Internal Medicineexamined bleeding risk among more than 1,200 patients taking warfarin at an outpatient Veterans Administration (VA) anticoagulation clinic. The patients were divided into three groups based upon the presence or absence of various risk factors. The study found that the patients in the high-risk category had a 10.6 percent chance of a major bleeding episode. Patients in the moderate and low risk groups had a 2.5 percent and 0.8 percent risk, respectively. The drug can also cause necrosis, or the death of body tissue, also called gangrene. Gangrene is a type of tissue necrosis that occurs when the blood flow to a large area of tissue is cut off, causing the tissue to breakdown and die. According to a 2014 study in the Annals of Dermatology, one in 10,000 patients taking warfarin will develop skin necrosis. It affects men four times as frequently as women. Risk factors include: obesity, viral infection and liver disease, as well as several vitamin and protein deficiencies. Deficiency in protein C-mediated anticoagulant response — a hereditary or acquired deficiency of protein C or its cofactor, protein S, has been specifically linked to tissue necrosis. The symptoms include a bluish or blackish discoloration of the skin along with pain and numbness in the region. The skin eventually breaks down into sores that have a foul-smelling discharge. Gangrene and necrosis can affect the skin and internal organs. It is a dangerous and potentially deadly condition that usually requires surgery, antibiotics and oxygen therapy. Severe cases can lead to amputation. While warfarin-induced skin necrosis (WISN) usually develops within three to 10 days of starting the drug, it can occur months or years later. Necrosis in patients taking warfarin can happen along with the formation of a blood clot inside of a blood vessel near the location of where the tissue death has occurred. Blood clots can result in additional blockages or obstructions to blood flow in affected areas. There is also a possibility of a blood clot breaking apart and moving to more critical parts of the body, such as the brain or lungs. Calciphylaxis, or calcium uremic arteriolopathy, has been reported in patients taking Coumadin (warfarin) with or without end-stage kidney disease, according to the durg’s label. Calciphylaxis is a serious, often fatal, condition in which the blood vessels become blocked by a build-up of calcium that prevents blood from flowing to the skin and internal organs. The lack of blood flow leads to tissue damage and necrosis (death of tissue). The first signs of calciphylaxis are usually ulcers that form in the skin and then become infected. The legs are most often affected. These lesions may start as tender red areas that eventually develop a livedoid pattern, or mottled, lace-like purplish discoloration of the skin. Eventually, the ulcerations become gangrenous and a person may develop sepsis. Unfortunately, the effects of calciphylaxis are often irreversible and many people die from infection within a few months. According to a 2013 study in the International Journal of General Medicine on “warfarin-induced calciphylaxis,” the death rate is as high as 60 to 80 percent. It can be difficult to distinguish warfarin-induced calciphylaxis (WIC) from warfarin-induced skin necrosis (WISN) because the signs and symptoms are similar, as are many of the complications. Only a skin biopsy can definitively differentiate between the two conditions. But the location of lesions can also provide clues. WISN lesions usually in fatty regions, such as the breasts, thighs, hips and buttocks. By contrast, 90 percent of patients with WIC develop lesions on their lower extremities. Treatment of the “devastating condition” is usually supportive and includes wound care and pain management. Patients who survive often undergo amputations. Coumadin (warfarin) is also linked to acute (sudden onset) kidney injury in patients taking the blood thinner who also have a history of kidney disease, possibly related to episodes of excessive anticoagulation and blood in the urine. Drug labeling for Coumadin recommends more frequent monitoring of anticoagulation effects in patients with impaired kidney functioning. The drug is also associated with an increased risk of the release of atheromatous plaque emboli, or hardened cholesterol and fat particles that can travel throughout the bloodstream becoming lodged in small blood vessels and blocking blood flow. This condition can result in various signs and symptoms depending on where the embolization (the passage of the clot and process of obstruction) occurs. The most common symptoms include those involving the skin, gangrene of the extremities and kidney failure.